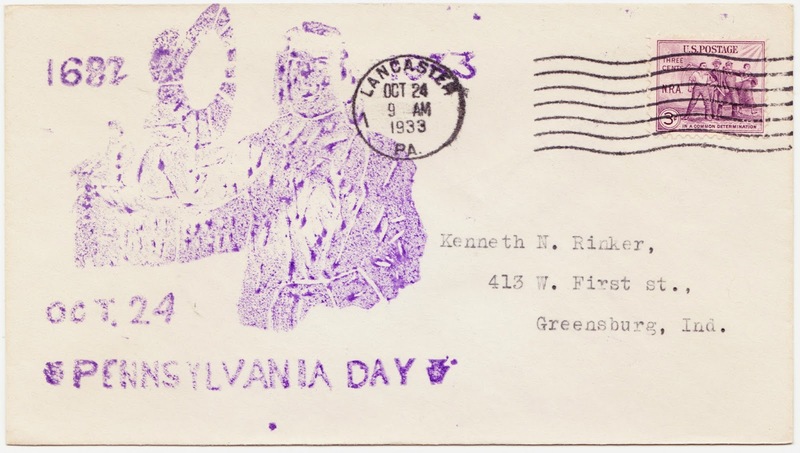 This event cover was produced for "Pennsylvania Day" in 1933 and features a crude purple stamp of commonwealth founder William Penn. The envelope, with its October 24, 1933, postmark from Lancaster, Pennsylvania, marks the 251st anniversary of ... well, that's where it gets confusing. March 4, 1681: Pennsylvania Colony founded by William Penn, as dictated in a royal charter granted by King Charles II. July 15, 1682: One of William Penn's agents, William Markham, meets with members of the Lenape Indian tribe under a white oak tree in Graystones Forest (now Morrisville) to negotiate the first land-purchase survey in Pennsylvania. August 30, 1682: William Penn sets sail for America aboard the ship Welcome. October 27, 1682: William Penn lands in America at New Castle, Delaware. October 27, 1682: City of Philadelphia is founded by William Penn. October 28 or 29, 1682: William Penn "first lands" in Pennsylvania, at Upland. 1682-1932Proclamations calling for the commemoration of this event were issued by the Mayor of Philadelphia and the Governors of Pennsylvania, Delaware and New Jersey." I do not know, however, if or when historians and officials gave up on the notion of October 24 being the proper anniversary date. 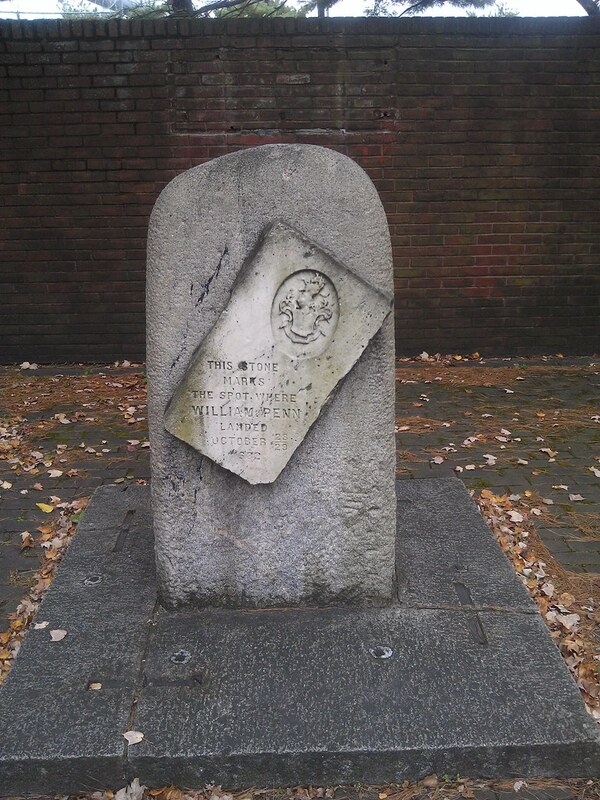 Even the stone monument erected at his landing site in 1882 states that the landing occurred on October 28/29. So I'm not sure what happened when they chose the earlier date in 1932. It's a History Mystery! was addressed to Kenneth N. Rinker of Greensburg, Indiana. It used the three-cent stamp touting U.S. president Franklin D. Roosevelt's soon-to-be-unconstitutional National Recovery Administration. Sci-fi book cover: "Beyond the Stars"